It was very interesting and, at times heartbreaking, to listen to Debbie and Kwami describe the struggles of slavery they were forced to endure. Being pulled from your homes, stolen from your family, and taken to a place you are completely unfamiliar with is what trafficking is all about. It's a con game that is nearly inescapable and these two endured it and ultimately became much better people because of it. Unfortunately, that is a rare achievement and that is why this documentary is a necessary way to shed light on he dark corners of our world. The perspective on human trafficking changes when it's in your own backyard so the cameras stay focused on small towns and rural areas where you might not think it had ever been an issue. It's important to understand that these people are not criminals, they are victims. They are the supply made available to meet the demand and this documentary is about humanizing an industry that is often sensationalized and the participants are dehumanized to the point of being disposable commodities. To Break the Chain is to take action. For more information, you an visit the film's official website. 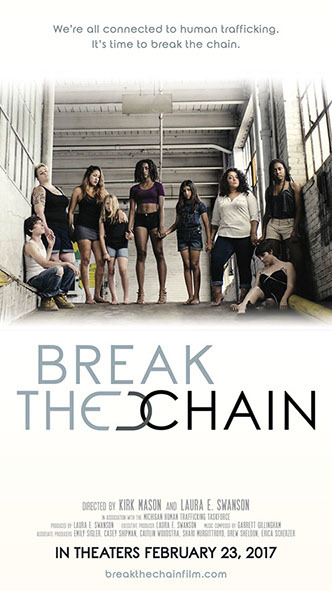 Break the Chain is an official selection of the 2017 Portland Film Festival. TwoOhSix.com coverage of the 2017 Portland Film Festival.